At the baseball field in Memorial Park, in Middletown, Maryland, a rural community about fifty miles northwest of Washington, D.C., stands a monument that townspeople erected in honor of Charlie Keller. It’s a bronze plaque affixed atop a waist-high, circular concrete pillar. Beneath a raised profile of Keller is a legend: “Charlie Keller … Middletown’s own … Pride, Character and Sportsmanship.” Below that are listed the highlights of Keller’s career. The pillar stands in the deepest reaches of center field. In 1930, however, the baseball diamond at Memorial Park was reversed, and the spot on which the pillar was erected is the exact place where Charlie Keller stood at home plate and learned to hit a baseball. Charles Ernest Keller, Jr. was born on September 12, 1916, on a 140-acre farm about 2 1/2 miles east of the park. He was the second child and eldest son of Charles Ernest and Naomi (Kefauver) Keller. In addition to his older sister, Ruth, Charlie had two younger brothers, John (known as Hugh) and Harold, (known as Hal), who became a catcher for the Washington Senators. All the children worked on the farm. “We all did,” said Jack Remsberg, a cousin of the Kellers who grew up with them, in reference to all the Middletown farm families. Each morning Keller would arise at 4:00 a.m. and help with milking the cows and plowing before heading to school. Such activity developed in the young boy a solid and muscular physique. Remsberg said that after school let out for the day, Charlie would play ball at the field and then run two and a half miles to the farm, where he would change into his work clothes in the barn so his father wouldn’t know he’d been playing. At Middletown High School, Charlie Keller, Class of 1933, became a schoolboy legend. During the Depression, when he was seventeen, the Kellers lost their farm and moved into town. However bad that was for the family, it gave Charlie the opportunity to develop his athletic skills. In addition to playing baseball, he was a guard on the basketball team, the leading offensive threat on the soccer team, and a runner on the track team. Although primarily a sprinter in the 100-yard dash, Keller once ran a 54-second quarter-mile, which won a state meet. It was in baseball, however, that he truly excelled. Starting as a catcher, Keller eventually played every position on the diamond, but alternated mostly between pitcher and catcher.1 Keller also played in a weekly Frederick County league, and by the time his senior season arrived he was one of the leading batters in the county. Unfortunately, his senior season was cut short when he was stricken with appendicitis. He played on the freshman baseball and basketball teams (freshmen couldn’t play varsity sports), and by his sophomore year Keller played not only those two varsity sports, but football as well.3 Although he had not played the game in high school, given his build (five feet ten and 190 pounds, with broad shoulders and a thick chest), the athletic department was confident he could take to football as he had to other sports. Accordingly, when the varsity opened its 1934 season against St. John’s (Maryland) with a 13–0 victory, sophomore Keller made his football debut at left defensive end by “toss[ing] a passer for a 10-yard loss on [Keller’s] first play.” By midseason, though, an ankle injury had sidelined him indefinitely, and, fearing another injury might jeopardize his baseball chances, he decided to drop football. The Yankees had agreed to let Keller finish his education. Once graduated, he was to report in June 1937 to the Newark (Bears, the Yankees’ entry in the International League. As it turned out, he arrived in Newark sooner than expected. Newark’s manager, Ossie Vitt, was thrilled to have him. Keller was a left-handed hitter, a commodity Newark desperately needed. He arrived in Sebring on March 22 and took batting practice the next day. After watching the twenty-year old slugger, Vitt decided Keller would be his starting right fielder, a position Keller had never played. In his exhibition debut, on March 25, pinch-hitting against the Cincinnati Reds, Keller tripled to left field at Sebring Park. A week later, against the Philadelphia Phillies, he hit a two-run, inside-the-park homer over the center fielder’s head, a hit, exclaimed Philadelphia’s Chuck Klein, playing right field that day, that was “the longest drive [I] ever saw.”9 Still, if the Yankees wanted him to become a pull hitter, Keller, anxious to please, would try to accommodate them. The experiment lasted for only a year. After trying throughout the 1937 season to please Yankees’ management by pulling the ball, by April 1938 Keller had returned to the style he favored. “They can save Babe Ruth’s crown for someone else,” he said. In 1937 Keller, who won the batting title with a .353 average and led the league in runs and hits, was named both the International League Rookie of the Year and Minor League Player of the Year. On January 21, 1938, in Baltimore, Keller wed Martha Lee Williamson, an athletic instructor at a private school. Jack Remsberg remembered Martha, a Baltimore native, as a “beautiful tennis player and golfer.” Keller and Martha had met three years previously when both were students at College Park. Their marriage lasted fifty-two years, until Keller’s death in 1990, and produced three children. On February 27, 1939, the three-time defending champion Yankees opened spring training in St. Petersburg, Florida. Manager Joe McCarthy had asked Keller to report a week ahead of the regulars so he could personally work with the twenty-two-year-old rookie who had played right field both years at Newark. Keller threw right-handed, explained McCarthy, a trait that “makes him conducive to left field,” and Keller, the manager affirmed, “definitely [is] a left fielder.”13 He was expected to compete with veteran George Selkirk, another left-handed batter, for a starting spot at that position. McCarthy also wanted Keller to again work on pulling the ball, but Keller was reluctant to do so. He said he didn’t want McCarthy to tinker with his swing. “I can hit well enough to make the grade even with a hitting team like the Yankees,” the rookie said. “I hit with the pitch. I never will be one of those home-run sluggers. If a man cannot bat well, tinker with him. If he can hit, why not let him be?”14 Nevertheless, Keller went to work once again altering his hitting style. Throughout the spring of 1939, McCarthy mentored Keller. He calmed the rookie and settled him down as he struggled to adapt to the change in batting stroke and often became frustrated. Gradually, Keller’s natural talent took over, and by April 1, when the team broke camp, McCarthy had named him the Yankees’ starting left fielder. But when Opening Day arrived, Keller was not ready to play. A muscle tear he had suffered in his thigh while at Maryland flared up again at Newark, and went without proper treatment. At St. Petersburg the problem returned, and the Yankees’ trainer advised McCarthy that Keller’s debut should be delayed. It wasn’t until April 22 that he played in his first big league game, as a pinch-hitter against the Senators in Washington. A week passed before Keller played again. He debuted before the home fans on April 29, against Washington. When Joe DiMaggio had to leave the game with an injured foot, McCarthy moved Jake Powell from left field to center field and inserted Keller in left. Keller had four at-bats and collected his first hit, a single off Ken Chase. On May 2, in Detroit, the same day Lou Gehrig ended his legendary consecutive-games streak, Keller made his first start. Playing left field and batting fifth, he hit a triple and a home run and drove in six runs. By June 6, he had started thirty-four games and was batting .319, with twenty-four runs batted in. Still, when DiMaggio returned to the lineup the next day, Keller returned to the bench. According to Halberstam, when Keller arrived at the ballpark that afternoon and found he was not in the lineup, he cried. McCarthy attempted to console his young player. He told Keller someday he would be a great Yankee star, but he would have to work on pulling the ball more, particularly in Yankee Stadium. For the remainder of that season and, indeed, the rest of his career, Keller heeded McCarthy’s advice. Throughout most of June and July, Keller was largely forgotten. Then, on August 2, McCarthy put him in right field to replace the slumping Tommy Henrich. 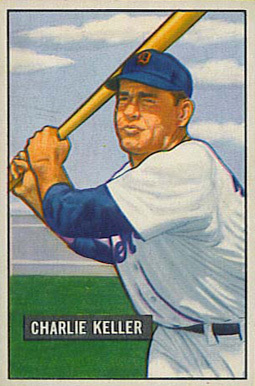 From then until the end of the 1946 season (minus 1944 and most of 1945, when he was in the military), Keller not only remained in the lineup, he became one of the most feared sluggers in the American League. Overall, in 111 games in 1939, he batted .334, fifth in the league, and was fourth with a .447 on-base percentage. In the World Series, as New York swept the Cincinnati Reds, Keller batted a team-high .438, with three home runs and six RBIs.16 After a season of abrupt starts and stops, it appeared that Keller had finally arrived. In 1940, as Henrich re-established himself in right field, Keller returned to left. Together with DiMaggio, the three formed arguably the premier outfield in the game during their time together. At the University of Maryland, Keller was saddled with the nickname he never cared for, King Kong.17 In 1948, writer Milton Gross visited the team in spring training and reminded readers why Keller had received the appellation. Keller, Gross wrote, “looked massive. His black, beetle-browed eyes, his muscled blacksmith arms, his thick neck and hogshead of a chest were of wrestler’s proportions.”18 As Keller finally matured into the pull hitter the club had always desired, that impressive physique produced equally impressive results. From 1940 through 1943, playing an average of 143 games a season, Keller batted .287 and had a .531 slugging average. He had 111 home runs, an average of twenty-eight per season, and averaged 102 RBIs over the four years. For all his power, Keller displayed remarkable patience at the plate, averaging 107 bases on balls per year. On January 20, 1944, Keller, now twenty-seven-years-old, at the peak of his skills, and earning $15,000 a year, was commissioned an ensign in the United States Maritime Service. For the next twenty months, he served as a purser, sailing the Pacific aboard merchant ships. “I didn’t see or touch a ball the whole time I was away,” he said in a 1973 interview.19 Keller returned in August 1945 to play the final six weeks of the season. “I wasn’t in shape to play,” he admitted. As it turned out, 1946 was the final full season of his career. At the beginning of 1947, the thirty-year-old Keller signed a $22,000 contract. Coming off a season in which he had hit thirty home runs and driven in 101 runs, the Yankees deemed him worth every penny, and he picked up right where he had left off in ’46. On June 5 Keller led the league in home runs, RBIs, and runs scored. That day, though, after walking and collecting a pair of base hits, he complained of soreness in his lower right back, and left in the sixth inning. Afterward, Keller said he had first experienced pain the previous day; he thought it had come from swinging awkwardly. On June 27, with the pain now radiating down his leg, Keller checked into New York Hospital for observation. One has only to travel ten miles northeast of Keller’s monument in Middletown to appreciate how he spent the rest of his life. Jack Remsberg said, “Charlie began his life on a farm and ended it that way too.” Before Keller realized his dream, however, he gave baseball one last try. On December 29, 1949, Keller signed with the Detroit Tigers for $20,000 to be the “the highest-paid pinch-hitter in the game.” Over the next two seasons, in 104 games, he batted .283 and hit five home runs, before Detroit released him on November 9, 1951. The following September, after two evening workouts at Philadelphia’s Shibe Park, Keller sufficiently impressed manager Casey Stengel for New York to re-sign the slugger as a pinch-hitter. After only one at-bat in two games (a strikeout), Keller was released by the Yankees on October 13, 1952. It was a testament to the Yankees’ respect for him that although he’d been with the team only two weeks in 1952, he was awarded a $1,000 World Series share. According to Jack Remsberg, Keller initially had standard farm animals, but when milking cows proved too demanding a lifestyle, “he got into the trotting horse business.” In 1955, Yankeeland Farms was born. The former Yankee became a breeder, and over the next thirty-five years Yankeeland Farms became nationally renowned for its line of champion harness racers. Each day, Keller mucked stalls, repaired fences, and “savored the simplest of farming pleasures.” His son Donald, who worked beside him for thirty years, remembered that his father “liked feeding horses and liked just listening to them eat.” Keller continued to work until he died of colon cancer in 1990 at the age of seventy-three. Today Charlie Keller rests in the Christ Church Reformed Cemetery in Middletown, two miles from the site of his birth, just behind the high school and a very long home run’s distance to right field from his monument, the place where it all began. Creamer, Robert W., Stengel: His Life and Times. New York: Simon and Schuster, 1984. Greenberg, Hank, The Story of My Life, edited by Ira Berkow. Chicago: Times Books, 1989. Halberstam, David, Summer of ’49. New York: William Morrow and Company, 1989. Kramer, Richard Ben, Joe DiMaggio, The Hero’s Life. New York: Simon and Schuster, 2000. Ungrady, David, Tales From the Maryland Terrapins: A Collection of the Greatest Stories Ever Told. Sports Publishing, LLC, 2003. Frank, Stanley, “Muscles In His Sweat”, Baseball Digest, February 1946. Gross, Milton, “Charlie Keller’s Comeback”, Sportfolio, September, 1948. Rumill, Ed, “Hitting the First Pitch”, Baseball Magazine, July, 1948. Personal interview by author with Jack Remsberg, Charlie Keller’s cousin, at Remsberg’s home on July 2, 2009. Charlie Keller interview by Kit Crissey, SABR Oral History Committee, February 10, 1973. 2. Keller was elected to the University of Maryland Athletics Hall of Fame in 1982. 3. About Keller the basketball player, Maryland coach Burton Shipley, who coached him in both basketball and baseball for two varsity seasons, said Keller “played basketball with a gorilla’s abandon” and “would do almost anything to get hold of the ball.” Shipley said Keller “wanted the ball more than anyone I ever coached.” As a junior in 1936, Keller was named All-Southern Conference as a guard, and also served as team captain. 4. Frederick (Maryland) News, March 31, 1935. 5. In 1983, Keller was elected to the initial class of the Kinston Professional Baseball Hall of Fame. 7. Frederick (Maryland) News-Post, June 3, 1939. 8. Frederick (Maryland) News-Post, March 5, 1939. 9. Frederick (Maryland) News-Post, April 19, 1938. 10. Frederick (Maryland) News-Post, August 23, 1937. 11. Frederick (Maryland) News-Post, May 24, 1938. 12. In 1947 Keller was named to the inaugural class of the International League Hall of Fame. 13. Sporting News, March 16, 1939. 14. Sporting News, March 9, 1939. 15. SABR Oral History Commitee interview of Keller by Kit Crissey, February 10, 1973. 16. In four World Series, totaling 19 games, Keller batted a combined .306, with 5 home runs, 18 RBI, a .367 OBP, and a .611 slugging percentage. 17. When Keller left the University of Maryland to sign with the Yankees, the Associated Press described him as "Charlie (King Kong) Keller, ace slugger of the University of Maryland’s baseball team.” (See, for instance, Reading Eagle, March 21, 1937). In Summer of ’49, author David Halberstam related that although Keller was one of the quietest Yankees, he was also “intimidating physically.” When Phil Rizzuto once dared to call Keller King Kong, Keller picked up Rizzuto “with one massive arm” and stuffed the shortstop in an empty locker. 18. Milton Gross, “Charlie Keller’s Comeback,” Sportfolio, September 1948. 19. SABR Oral History Commitee interview of Keller by Kit Crissey, February 10, 1973. 20. Gross, Milton, “Charlie Keller’s Comeback,” Sportfolio, September 1948. 23. In both 1957 and ’59, Keller returned to the Yankees as a coach. 24. Keller’s two sons, Charlie Jr. and Donald, were also ballplayers and Keller managed their Little League teams. Both went on to careers in the Yankees’ Minor League system before back injuries similar to their father’s ended their careers. Charlie played four seasons, and Donald playedn three seasons.